Very rarely will you encounter a home that as been built without some form of lead work on it, whether it’s on a chimney, valley, or the flashing on a single story extension. Lead is an integral part of your homes ability to remain watertight, and without it, or with damaged or poorly installed lead work you will experience water penetration sooner or later. Thicker grades of lead should be used depending on it’s overall purpose, ie, frequent foot traffic flat roofs and gutters where extra rigidity is required to resist wind uplift, As a roofing company we never use lead below grade 4. Anything less should not be used when bossing or forming lead, as the maximum 25% thinning of bossed lead can easily be exceeded. 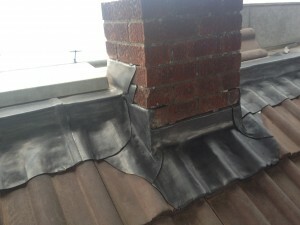 We are experienced in many applications of leadwork, from straightforward aprons for chimneys, to lead ridge work, all the way through to lead coverings for pitched or flat roof constructions. All carried out with an emphasis on quality workmanship, and customer satisfaction.